The format and distribution of the image was as poster in an edition of 100, printed and posted by a commercial fly-poster company on various legal poster sites around Dublin city for the period 30 August – 12 September 1999. 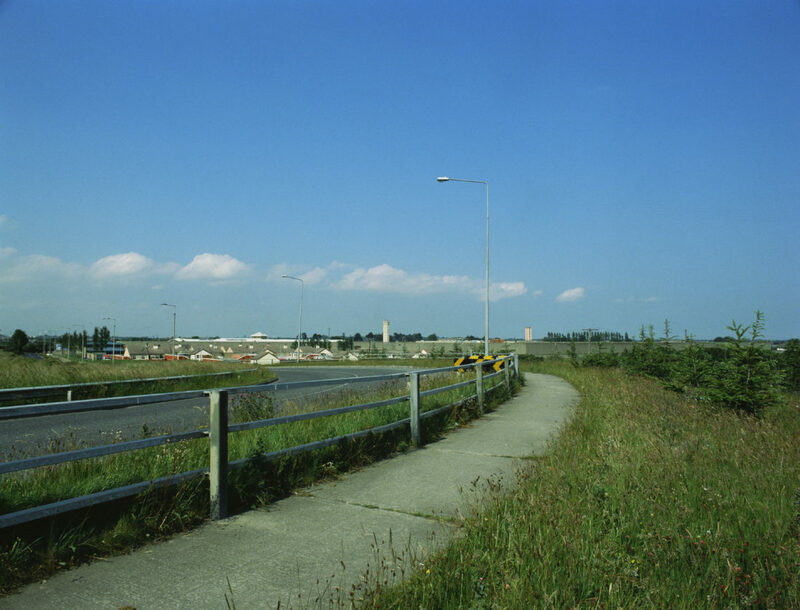 View was a commissioned by Valerie Connor, Curator of Visual Art, Project Arts Centre as part of its Off-Site programme. The Project Off-site programme was initiated during the period of construction of its current building. The significant subject matter of this image occupies a horizontal “zip” across the centre of the frame. From the point of perspective of the viewer, as the road veers to the left a series of buildings form an axis: a halting site for the travelling community in front of a prison in front of court complex in front of a converted fever hospital now housing refugees.